Wednesday!! What a great day, huh?? 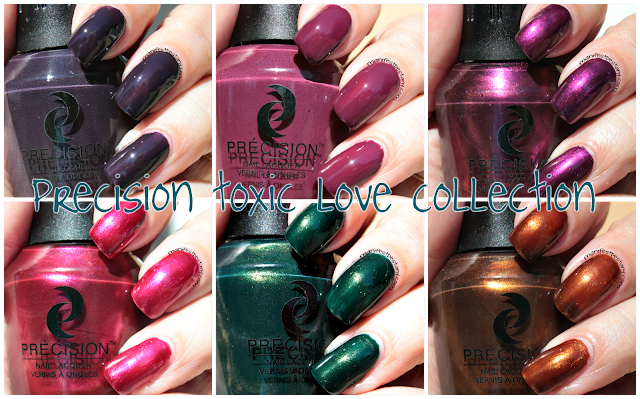 I have the Precision Toxic Love collection for you today. These polishes are soft and creamy and most of them apply in one coat! You all know how much I love one-coaters right? Beautiful fall colors right? I think this collection fits right in with this time of year! The formula on the two creme polishes in this collection is spot-on. Just right right consistency....slid on my nails like butter. The shimmers were a little on the thinner side, but they built up nicely. I describe the colors in my own way in this post haha! But there are official descriptions on each polish's page. 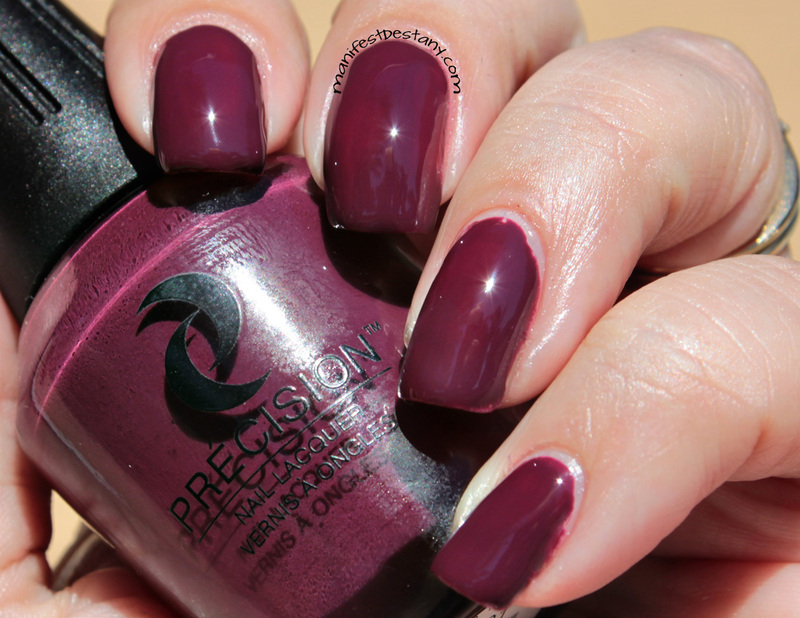 I'm Addicted To You: A dark purple creme. This color is amazing! Super shiny and a one-coater! (Altho you can see I sort of smudged it up at the tip of my ring finger, oops!) Depending on how you apply this polish, it could need a second coat, but my mouth dropped open when I applied the first coat and got this result. I'd Love To Hate You: a grape-y purple creme. 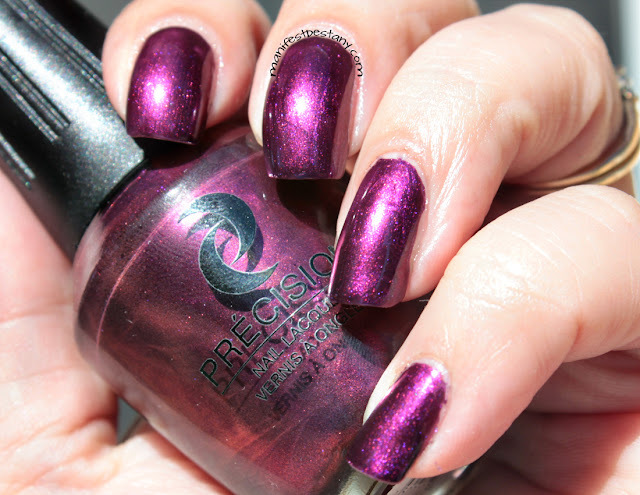 There are definite reddish undertones to this beautiful purple shimmer. Again, this is one coat of the polish. I find myself having issues with photographing shimmers sometimes...they end up looking like they are swimming on my nails, or just downright wrong. But this one is pretty true to color. I had a little bit of trouble photographing this polish. I almost had to blow out my hand (so I look like I'm so darn pale!) to get the color close. It's a lovely color - just hard to get photos to look right! haha This photo is a good representation of the color. I am a huge fan of greens, so I love this one :) It did take two coats, but it was worth it. Toxic Wast-ing My Time: a caramel-ish bronze shimmer. Do you guys have any Precision polishes? I so love these! I think the formula is great, and the colors are nice! 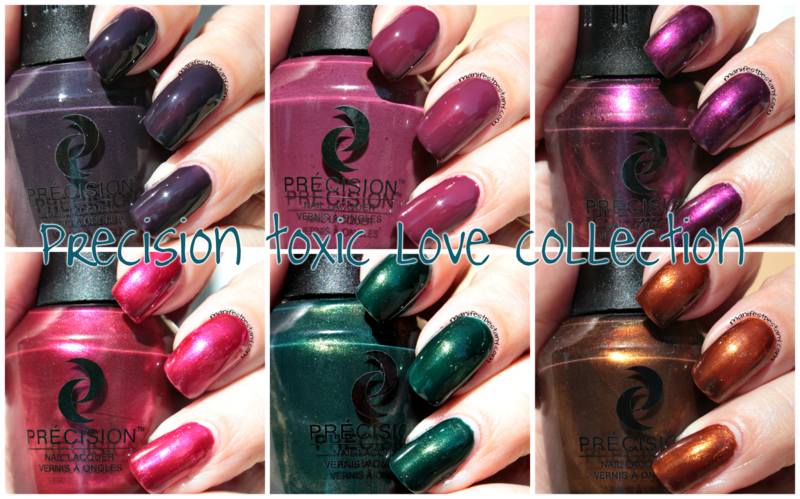 They have a wide range of polishes listed on the website. They retail for $5.99.